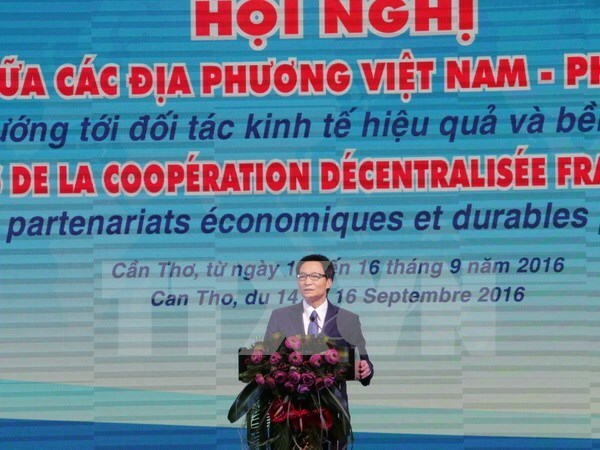 Can Tho (VNA) – The 10th conference on the cooperation among Vietnamese and French localities concluded in the Mekong Delta city of Can Tho on September 16, with the adoption of a joint statement and the signing of five memoranda of understanding among 12 localities of both sides. At the event, 28 Vietnamese cities and provinces called for French investment in 57 projects worth over 7.1 billion USD in various areas, including health care, environment, agriculture, tourism, industrial park infrastructure, seaport, and logistics. The projects include an 18.3 million USD one to build a food storage centre in Dong Thap Muoi area in Long An province, a 3.5 billion USD one on constructing Hon Khoai seaport in Ca Mau province, and a 50 million USD project to develop infrastructure system for Cam Ranh industrial park. Meanwhile, Can Tho city introduced two projects on building a high technology agriculture area at a cost of 26 million USD, and developing Con Son tourism site with an investment of 100 million USD. According to French Ambassador to Vietnam Jean Noel Poirier, the conference helped foster the partnership and deepen mutual understanding between Vietnam and France through the exchange of ideas on issues of shared concern. He lauded the idea to associate the conference with cultural and artistic events, including a book and photograph exhibition, a calligraphy presentation, a Vietnamese-French culinary fair, the screening of French films and a Can Tho tourism display, which drew a large number of visitors. He also expressed hope that following the conference, more French investment will be poured into Vietnamese localities. On his part, Vo Thanh Thong, Chairman of the Can Tho People’s Committee expressed wish that Can Tho and French partners will work together in implementing joint projects, contributing to fulfilling the city’s target to become a modern city playing the role as a hub of industry, trade, service, education and training, science and technology, and health care in the Mekong Delta region. He also handed over the role as the host of the 11th conference in 2019 to France’s Toulouse city.